Not every digital image on your MacBook is perfect. For those shots that need a pixel massage, iPhoto includes a number of editing tools that you can use to correct common problems. The first step in any editing job is to select the image you want to fix in the Viewer. Then click the Edit button on the iPhoto toolbar to display the edit mode controls at the right side of the window. Now you’re ready to fix problems. Need more features than iPhoto provides when editing a prized photograph? 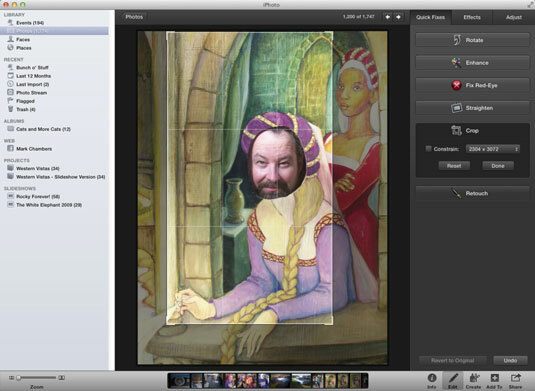 iPhoto allows you to specify another image-editing application such as Photoshop Elements. First, choose iPhoto→Preferences→ Advanced. From the Edit Photos pop-up menu, opt for Choose App. Navigate to the image editor you want to use, select it, and click Open. Close the Preferences dialog, and iPhoto automatically opens the application you selected when you click the Edit button. If you decide to return to iPhoto’s built-in editing controls, just open the Advanced pane again, click the Edit Photos pop-up menu again, and choose In iPhoto. When you’re done with edit mode, click the Edit button again to return to the Viewer. When you first enter edit mode, the Quick Fixes tab is selected. You use these tools for the changes you’ll make most often. However, you can also choose to apply an effect from the Effects tab, or make specific changes to the appearance of an image from the Adjust tab. If an image is in the wrong orientation and needs to be turned to be displayed correctly, click the Rotate button to turn it once in a counterclockwise direction. Hold down the Option key while you click the Rotate button to rotate in a clockwise direction. Find yourself using that Option key often while rotating images? Consider reversing the default direction. Choose iPhoto→Preferences, click the General tab, and then select the Rotate radio button to change the default direction. Does that photo have an intruder hovering around the edges of the subject? You can remove some of the border by cropping an image, just as folks once did with film prints and a pair of scissors. With iPhoto, you can remove unwanted portions of an image; cropping is a great way to get Uncle Milton’s stray head out of an otherwise perfect holiday snapshot. Click the Crop button on the Editing toolbar. Select the portion of the image that you want to keep. In the Viewer, click and drag the handles on the rectangle to outline the part of the image that you want. Remember, whatever’s outside this rectangle disappears after the crop is completed. When you drag a corner or edge of the outline, a semi-opaque grid appears to help you visualize what you’re claiming. You can expand the outline to the full dimensions of the image at any time — just click the Reset button. (Optional) Choose a preset aspect ratio. If you want to force your cropped selection to a specific aspect ratio — such as 4 x 3 or 16 x 9 for an iMovie project — select the Constrain check box and choose that ratio from the Constrain pop-up menu. Oh, and don’t forget that you can use iPhoto’s Undo feature if you mess up and need to try again. Just press cmd+Z. Was your camera slightly tilted when you took the perfect shot? Never fear! Click the Straighten button and then drag the slider to tilt the image in the desired direction — iPhoto also slightly crops the image to return it to a rectangular shape. Click the Done button to return to edit mode. If a photo looks washed out, click the Enhance button to increase (or decrease) the color saturation and improve the contrast. Enhance is automatic, so you don’t have to set anything — but be prepared to use Undo if you’re not satisfied with the changes. Unfortunately, today’s digital cameras can still produce the same “zombies with red eyeballs” as traditional film cameras. Red-eye is caused by a camera’s flash reflecting off the retinas of a subject’s eyes, and it can occur with both humans and animals. iPhoto can turn frightening zombies back into your family and friends! Click the Red-Eye button and then select a demonized eyeball by clicking in the center of it. (If the circular cursor is too small or too large, drag the Size slider to adjust the dimensions.) To complete the process, click the Done button. The iPhoto Retouch feature is perfect for removing minor flecks or lines in an image. When Retouch is active, the cursor turns into a circle. (Drag the Size slider to change the size of the Retouch cursor.) Simply drag the cursor across the imperfection and click Done when you’re finished touching up. Don’t forget to take a moment and marvel at your editing skill! Ever wonder whether a particular photo in your library would look better as a black-and-white print? Or perhaps an old-fashioned sepia tone? Trying out iPhoto’s effects on your photos is fun! Just click the Effects tab, which offers nine effects you can apply, including black-and-white and sepia. You can also make one-click photo changes from the Effects tab, including lightening and darkening an image or enhancing the contrast. Click the Adjust tab to perform manual adjustments to brightness and contrast, as well as attributes such as the sharpness, shadow, and highlight levels. To adjust a value, make sure that nothing’s selected in the image and then drag the corresponding slider until the image looks the way you want. Click the Close button to return to edit mode.